I just returned from a wonderful afternoon volunteering at the Boys & Girls Club. We read a lot, shared some good stories, and enjoyed a yummy snack. I baked banana bread for the occasion and paired it with apple slices and a cold glass of milk. 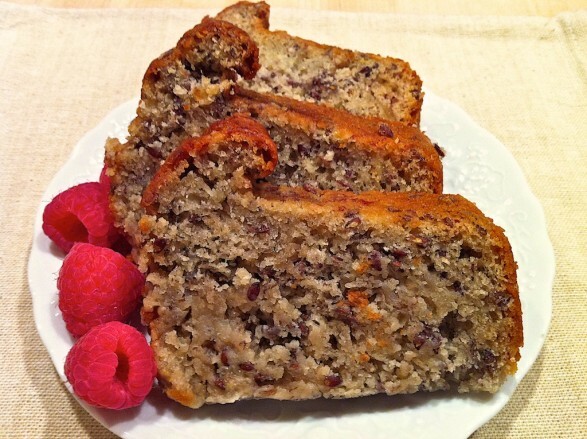 This banana bread is one of my oldest recipes. A slow-baked version–you actually bake it at 250 degrees and the finished product is moist and delicious. One batch was plain, the other had dark chocolate chips. I thought they would enjoy a taste test. Chocolate won! This makes two large loaves, freezes well, and mixes up in one bowl. May add 1 cup walnuts or pecans and/or 1 cup chocolate chips–I like dark chocolate but you could use milk, semi-sweet, mini chips, or chunks. Sometimes, I also add an additional banana–diced–after mashing the first four. Mash bananas well in a large bowl. Add the remaining ingredients in order and mix well. Pour batter into 2 greased, 9×5-inch loaf pans. Bake for 1 3/4 to 2 hours at 250 degrees–yes, 250 degrees!–or until a toothpick inserted into the center comes out mostly clean and the top is golden. Cool for 10-15 minutes, then remove from pans and cool completely on a baking rack. A batch without the chocolate chips…this moist, tender bread truly needs no mix-ins! Just baked it, had a slice. Very moist and good flavor. Love it. Thank you, Debbie! Glad you enjoyed…I think it even improves with age and hope you agree! Hi Ann …. 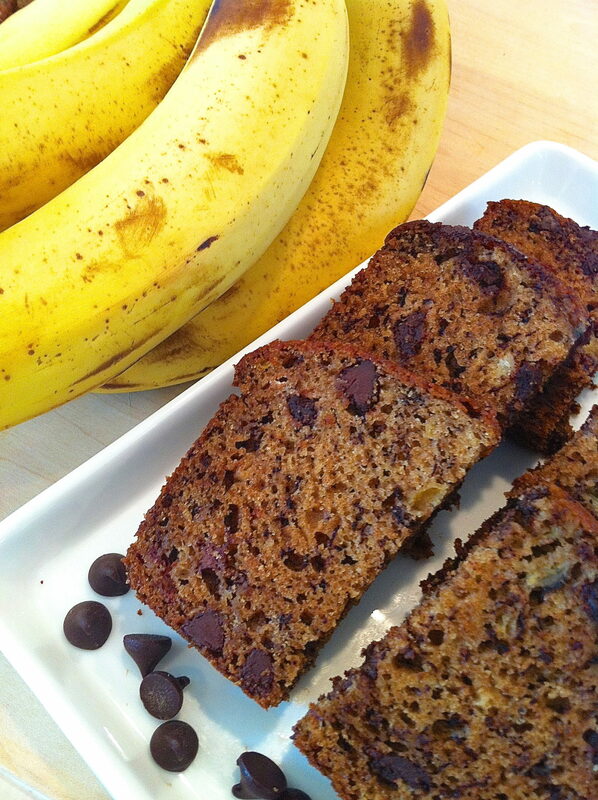 I had 4 very ripe bananas so I decided to make this recipe. In addition to the 1 cup of chocolate chips and 1 cup of pecans, I also threw in 1 cup of coconut. Very delicious! The bread was perfectly moist. I’m assuming that you wouldn’t get the same effect if baked at 350 degrees for an hour? I’ve always stuck with the 250 temperature, Rila. It would likely work at 350, although this method virtually eliminates the chance of over-baking and drying out the bread. I am made this yesterday and it’s almost gone. I have a second loaf in the oven right now. That two hours is a long time to wait! Too funny, Amie…and I am so glad it was worth the wait!! Just made this last night, substituted 1/2 cup unsweetened applesauce for the 1/2 cup of oil, and it turned out great! Baked it in my oven for 1h 55min and it was nice and moist on the inside. Yum!! I think I may be converted from my usual pumpkin bread – this recipe was so, so easy! Thanks for mentioning the applesauce for oil swap, and I’m thrilled this was a hit, Laura! Does baking it longer help keep the outside from getting to dark? That is my biggest problem, due to the heavy nature of Banana bread it always seems to get dark on the outside before the inside is done. With the lower oven temperature, I never have a problem with this bread becoming too dark on the outside before cooking all the way through the center. When I do have this problem with a baked good in general, however, I drape a piece of foil over the top and that usually does the trick. I have to use Gluten Free flour. Do you know if I would use the same amount of flour or make any changes to this recipe? Thank you I can’t wait tor try this recipe out !! Hi Debbie, For a gluten-free loaf, I would use a cup-for-cup all-purpose flour substitute. Hope you enjoy!